FitzRoy was started by families, and remains committed to understanding the challenges families face when looking for the best support for their son or daughter. We work in partnership with family members, building a strong trusting relationship that can last a lifetime. This not only helps us get to know each person, their background, their culture, and preferences, it ensures we adapt and change the support as each person grows and develops. Families are involved in the support, make comments and suggestions, understand our philosophy and feel part of FitzRoy. Everything is discussed with me, whenever a change is needed for my sister. 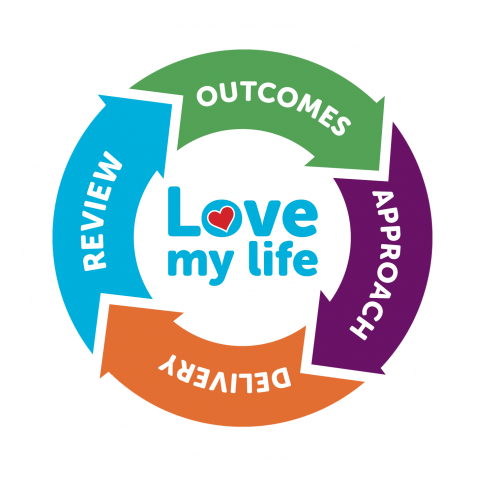 Quality of life is achieved through support that maximises independence through wellbeing, health promotion, personal development and building strong social networks. This facilitates new opportunities and lifestyle choices that are not solely rooted in services but truly connected to the local community. FitzRoy does this through creative support planning, designed during meetings and reviews with individuals, their families and other stakeholders. This helps us ensure the right amount of support – not too much and not too little. He is inspired by going out to church, swimming pools, music workshops, cooking sessions, sensory sessions, theatre, cinema, gardens, museums, pubs, cafes, shops days out, holidays, the list is impressive. Thank you from all the family. We have a strong safeguarding culture and these values are lived at every level of the organisation, so that every person we support can live their life free from abuse, exploitation, and fear of aggression and violence. We believe the best outcomes occur when people are in control of their health, with information they understand. We have signed up to the Health Charter by Public Health England. Using a technique called ‘sorting important’ we work with people to identify ways they can balance being happy and content with being healthy and safe. Our son is happy, safe, in good and caring hands, and has a chance to realise his wishes. Thank you FitzRoy! Technology liberates people through increased choice, control, and independence. Whether it is a device to help someone speak, a responsive on call system, an iPad, or a button to open your own bedroom door, using assistive technology is essential to helping people achieve their goals. Everyone is unique in how they express themselves. To ensure we truly understand each person, we use Communication Passports to understand each person’s preferred methods of communication. This person-centred technique helps people express themselves through various methods: Makaton, BSL, Braille, touch, and pictures. It helps build trust and we invest time in conversations that cement strong relationships so people feel comfortable discussing their history, and what is important to them. Without FitzRoy I would have lost my voice. A major worry for parents is how to prepare for the transition between child services and adult services for a son or daughter with a learning disability. Adult services differ from children’s services and it is helpful to find out what your child is eligible for as an adult as soon as you can. There will be a change of professionals in your life, and a different set of services available. At the same time your child will be leaving school, and embarking on new life choices, such as employment, volunteering, moving out of home, and so on. It is a good idea to request an assessment by your local authority; they won’t refuse unless they think there is a ‘significant benefit’ in not making an assessment. There is no set age for the assessment and it makes sense to plan in advance to prevent gaps in support. We were delighted with how Neil settled in to his new home – the staff team working with Neil did a tremendous job in planning the move so that everything could go as smoothly as possible. We are so pleased that Neil has his own car so that he can go into the community. Downs Syndrome Association – Offers support to people with Down’s syndrome, their family and carers. British Institute of Learning Disability – Seeks to improve the quality of life for all people with a learning disability. Carers UK – Provides information and support to carers. Contact a Family – Provides support, advice and information for families with disabled children, no matter what their condition or disability. Find Me Good Care – Provide online advice for adult social care across the country. About Autism – Find out about diagnosing autism (including Asperger syndrome), and find advice and support on all aspects of life with autism.